Ever taken on a project that has turned into long running saga? Here’s mine – after months of work. I wanted a large piece for a stairwell on a sea theme. I was intrigued by the structure of waves in water where, within each wave, there are other levels and wavelets – the notion of fractals and ever repeating patterns and forms. As I built the piece I was taken by the anthropomorphic array of the blocks, reminding me of serried ranks of Chinese warriors or in this case the throngs who try to cross seas in search of some form of a normal life. The colours perhaps reflect the failure and success of these individuals. The wooden blocks were made from a couple of gates that I replaced. My neighbour didn’t want any more of the wood for their stove as the paint on the wood generated a lot of ash, so I took to cutting it down into strips to make the piece. It had an extra kind of resonance that the work is made from a gate. After all this time, and having been able to mount it on a wall, I think it could be modified further, for better impact, so I fear it could be a few more months of work yet. 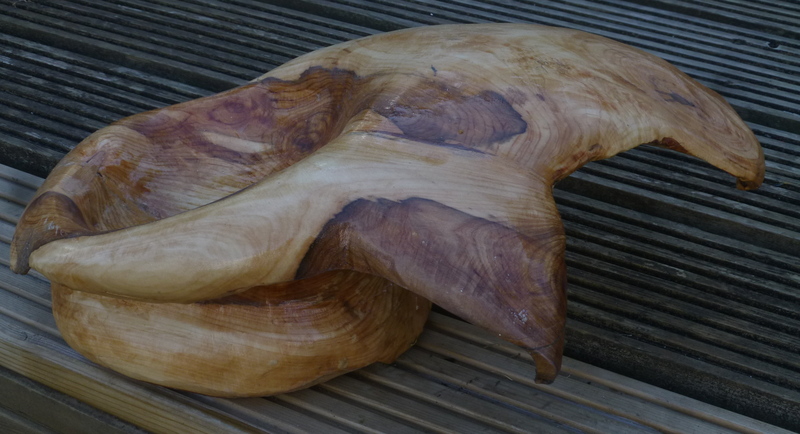 This is a piece I have just carved which is made up of a trunk which was cut into two and then joined together to increase the width. I wanted the feel of water being thrown aside by a sudden force , like a rock hitting the surface. One of the problems carving tree trunks means that the subjects tend to be long and thin which can be a bit repetitive. This was an attempt to get greater scope. The actual join was not entirely satisfactory as the trunk was too big for my circular saw, but I managed to fill the gaps. Not sure about the impact of the piece, but you can only try. A change of pace and medium. I get given small trunks of trees and the sizes rather restrict the possibilities, but I was pleased with the outcome of this one. Carving through the outer wood and into the heartwood gives some interesting tonal changes. The strip of wood has the feeling of fabric in freefall. A change of pace and materials. My old pear tree succumbed to honey fungus and I got myself a new one and decided to make something out of the trunk. As it wasn’t very big I was a bit limited to subject and thought about carving a backbone. In the end I opted for the easy option.